Date of birth Mar 10, 1961 Ames, Story County, Iowa, U.S.A. Date of death Feb 01, 2003 Texas, U.S.A.
Laurel Blair Salton Clark (March 10, 1961 – February 1, 2003) was an American medical doctor, United States Navy Captain, NASA astronaut and Space Shuttle mission specialist. 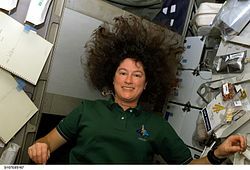 Clark died along with her six fellow crew members in the Space Shuttle Columbia disaster. She was posthumously awarded the Congressional Space Medal of Honor. Clark was born in Ames, Iowa, but considered Racine, Wisconsin, to be her hometown. Clark was a member of the Gamma Phi Beta sorority at the University of Wisconsin - Madison. She held a Federal Communications Commission (FCC) issued Technician Class amateur radio license with the call sign KC5ZSU. She is survived by her husband, fellow NASA flight surgeon Dr. Jonathan Clark (who was part of an official NASA panel that prepared the final 400-page report about the Space Shuttle Columbia disaster), and son, Iain. Clark was a member of the Aerospace Medical Association and the Society of U.S. Naval Flight Surgeons. She was also a member of the Olympia Brown Unitarian Universalist Church in Racine, Wisconsin. During medical school Clark did active duty training with the Diving Medicine Department at the United States Navy Experimental Diving Unit in March 1987. After completing medical school, she underwent postgraduate medical education in pediatrics from 1987 to 1988 at the National Naval Medical Center. The following year she completed Navy undersea medical officer training at the Naval Undersea Medical Institute in Groton, Connecticut, and diving medical officer training at the Naval Diving and Salvage Training Center in Panama City, Florida. Clark was designated a Radiation Health Officer and Undersea Medical Officer. She was then assigned as the Submarine Squadron 14 Medical Department Head in Holy Loch, Scotland. During that assignment she dove with Navy divers and Naval Special Warfare Unit Two SEALs, and performed many medical evacuations from US submarines. After two years of operational experience she was designated as a Naval Submarine Medical Officer and Diving Medical Officer. Clark underwent six months of aeromedical training at the Naval Aerospace Medical Institute st NAS Pensacola in Pensacola, Florida, and was designated as a Naval Flight Surgeon. She was stationed at MCAS Yuma, Arizona, and assigned as Flight Surgeon Marine Attack Squadron 211 (VMA-211), a Marine Corps AV-8B Harrier squadron. She made several deployments, including one overseas to the Western Pacific, practiced medicine in austere environments, and flew on multiple aircraft. Her squadron won the Marine Attack Squadron of the Year award for its successful deployment. She was then assigned as the Group Flight Surgeon for Marine Aircraft Group 13 (MAG-13). Before her selection as an astronaut candidate she served as a Flight Surgeon for Training Squadron 86 (VT-86), the Naval Flight Officer advanced training squadron for tactical jets at NAS Pensacola. Clark was Board Certified by the National Board of Medical Examiners and held a Wisconsin Medical License. Her military qualifications included Radiation Health Officer, Undersea Medical Officer, Diving Medical Officer, Submarine Medical Officer, and Naval Flight Surgeon. She was a Basic Life Support Instructor, Advanced Cardiac Life Support Provider, Advanced Trauma Life Support Provider, and Hyperbaric Chamber Advisor. Selected by NASA in April 1996, Clark reported to the Johnson Space Center in Houston, Texas in August 1996. After completing two years of training and evaluation, she was qualified for flight assignment as a mission specialist. From July 1997 to August 2000 Clark worked in the Astronaut Office Payloads/Habitability Branch. Clark flew aboard STS-107, logging 15 days, 22 hours and 21 minutes in space. STS-107 Columbia – The 16-day flight was a dedicated science and research mission. Working 24 hours a day, in two alternating shifts, the crew successfully conducted approximately 80 experiments. Clark's bioscience experiments included gardening in space, as she discussed only days before her death in an interview with Milwaukee media near her Wisconsin hometown. The STS-107 mission ended abruptly on February 1, 2003, when Columbia disintegrated and her crew perished during re-entry, 16 minutes before scheduled landing. Clark also recorded inside the cockpit during Columbia's descent into the Earth's atmosphere on a small digital camera. Clark's final message to her friends and family was through an email sent from Columbia. The † symbol indicates a posthumous award. Asteroid 51827 Laurelclark was named for Clark. Clark Hill in the Columbia Hills on Mars was named for Clark. L. Clark, an interior crater of the lunar crater Apollo, was named for Clark. Clark Hall, in the Columbia Village Suites at the Florida Institute of Technology, is named after her. The apartments were initially planned to be named the Crane Creek Suites, but were renamed in 2008 to commemorate the Columbia crew. The Laurel Salton Clark Memorial Fountain in Racine, Wisconsin is named for her. Clark Auditorium at Walter Reed National Military Medical Center, Bethesda, Maryland is named for her and displays uniforms, training manuals, and personal items that belonged to her. The Scottish band Runrig pays tribute to Clark on the 2016 album The Story. The final track, "Somewhere", ends with a recording of her voice introducing the song. Clark was a Runrig fan and had a wake up call with Runrig’s "Running to the Light". She took The Stamping Ground CD into space with her. When the shuttle exploded the CD was found back on Earth, and was presented to the band by her family. What's the good word on Laurel Clark? American engineer, a former United States Navy officer, and a former NASA astronaut. A U.S. Navy Commander, NASA astronaut and the pilot of Space Shuttle Columbia which was destroyed during re-entry into the Earth's atmosphere in 2003. American naval flight officer and NASA astronaut.